If you are looking for the ultimate in home comfort, a warm-water in-floor central heating system is the best heating option for you. These systems consistently deliver heat throughout your whole home and warm you from the feet up. Radiant heat warms objects directly without heating the surrounding air, thus avoiding the dry air associated with other types of central heating. In-floor heating has no forced air movement, draughts, or any hot and cold spots. Heat is passive and discreet – there is no physical machine within the living part of the house apart from the controller. Also referred to as underfloor heating, these systems come with a controller (generally an electronic control panel affixed to the wall) that allows you to control the temperature of the floor, ensuring maximum efficiency out of your underfloor heating system. As the concrete slab is warmed by the sun during the day, the control panel modulates the temperature to provide a consistent temperature and energy savings. The energy source is usually a heat pump that makes hot water or diesel boiler if we are fitting radiators in the home as well. Wood burning boilers are also available, but this does turn the system into a manual heating system, which will require effort on your part to keep the boiler burning constantly. 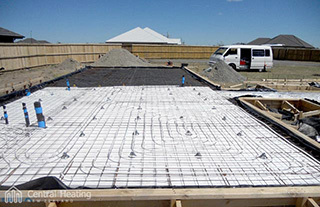 In-floor heating can only be installed in new homes, or homes that have had a complete renovation where the floor has been dug up. This is because the tubes that the warm water passes through are laid in circuits within the concrete slab of your floor. 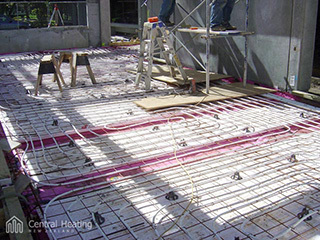 A heat source (usually a boiler or a heat pump) heats the water and pumps the warm-water through the pipes, warming up the concrete slab as it goes. Do you need advice on whether in-floor central heating is the right heating solution for your home?